Amanda Chmielewski inspects costume jewelry at the first flea market of the season sponsored Sunday by the Fairfield Warde High School PTA. FAIRFIELD — Tag sale fans and collectors turned out Sunday for the season-opening flea market at Fairfield Warde High School, a series of monthly sales through October coordinated by the school’s PTA. While skies were bright, a gusty wind chilled temperatures, forcing browsers to bundle up and vendors to hold down merchandise on sale in the school’s parking lot at the corner of Melville Avenue and Knapps Highway. Vendors offered a range of merchandise, from books and coins to home décor and clothing. An ice cream truck and hot dog cart served up food, while Warde students conducted a baked goods sale to raise funds for their Relay for Life team. 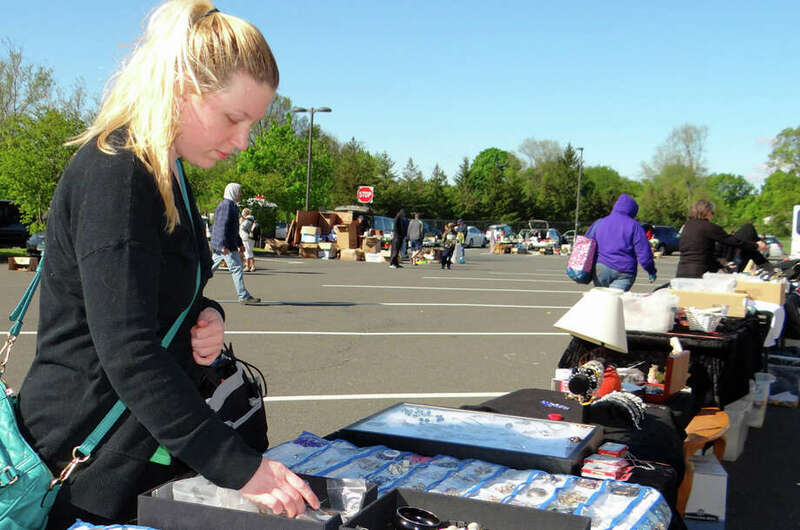 The season’s remaining flea markets are planned Sundays, from 8 a.m. to 3 p.m., on June 19, July 17, Aug. 14, Sept. 11 and Oct. 16. Rain dates for each of the markets, with the exception of the Sept. 11 event, are planned for the Sunday a week after the scheduled date.